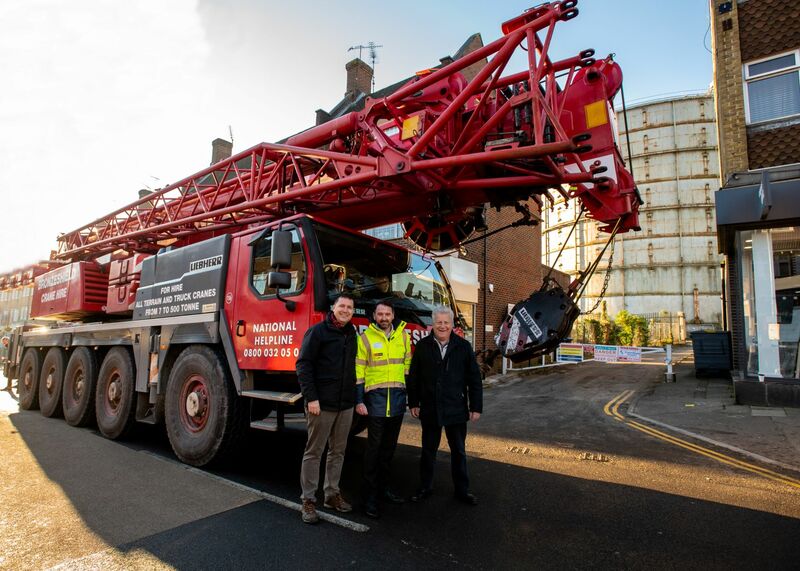 A small crowd, including local children with purple RegenOxted flags, gathered at 8am on Sunday 3 February to witness a 60 tonne mobile crane being driven down Oxted’s high street to the gasholder site. The crane will be used to help dismantle the gasholder. It will hold a basket from which two workmen will cut the gasholder into pieces, which will be dropped inside the gasholder before being removed from the site. Most of the materials removed will be recycled. The work will be carried out by demolition experts John F Hunt on behalf of St William Homes LLP, which is the owner of the gasholder site. Demolition of the gasholder is due to be complete around May 2019. Following this some groundworks will take place before work begins to build the 111 one, two and three bedroom apartments, with car parking and landscaped courtyard gardens. The first homes are due for completion in January 2021. The demolition of the gasholder and its replacement with a high quality residential scheme will enhance Oxted town centre and forms part of the Council’s regeneration plans for the area. The Council is working with key stakeholders to minimise disruption to the town centre and local residents. The Council is working with the Love Oxted Business Improvement District to publicise an “Open for business” initiative to encourage people to continue to support the shops and businesses in Oxted while the building work takes place. The removal of the gasholder is part of the RegenOxted programme, which will also see provision of additional parking, an Urban Redesign project and a hub to encourage the start-up and growth of local businesses. Councillor Martin Fisher, Leader of the Council, said: “When I became the Leader of Tandridge District Council almost three years ago, one of my aims was to achieve the removal of the Oxted gasholder. This is something the community has wanted for such a long time and we have finally made it happen. This has been the result of a lot of hard work by councillors and officers and the many great partners involved in the project. For further details and to register your interest please visit www.berkeleygroup.co.uk/developments/surrey/oxted/courtyard-gardens. To keep up to date with the RegenOxted project, please sign up for the Council’s e-mail newsletters by visiting www.tandridge.gov.uk/signup.